Description: In this addition to the well-received Paideia series, a respected New Testament scholar examines cultural context and theological meaning in First Corinthians. Paideia commentaries explore how New Testament texts form Christian readers by attending to the ancient narrative and rhetorical strategies the text employs showing how the text shapes theological convictions and moral habits commenting on the final, canonical form of each New Testament book focusing on the cultural, literary, and theological settings of the text making judicious use of maps, photos, and sidebars in a reader-friendly format Students, pastors, and other readers will appreciate the historical, literary, and theological insight Pheme Perkins offers in interpreting First Corinthians. 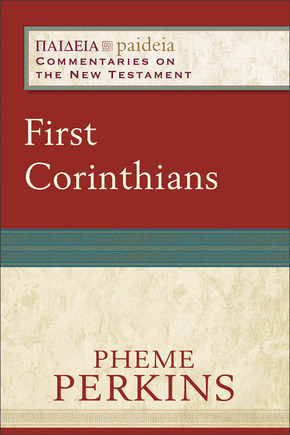 Citation: H. H. Drake Williams III, review of Pheme Perkins, First Corinthians, Review of Biblical Literature [http://www.bookreviews.org] (2015).